Mr. Jeff Hinman, District Superintendent, was born and raised in Tremont and is a proud member of the THS Class of 1982. He still lives in town with his wife Jennifer (also a THS alum) and two school-age children. 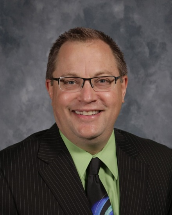 He earned his Bachelor’s Degree at Illinois State University in Social Science Education and began his teaching career at Forman High School in Manito eventually accepting a position at THS teaching history and civics in the Fall of 1988. His administrative career began at Ingersoll Middle School in Canton in 1994. One year later, he was fortunate to once again come back to the Tremont system when he accepted the position as Jr. High principal. In the Fall of 2000, he began a 7 year stint as both the middle and high school principal before concentrating solely on the high school in 2007. He began his new assignment as superintendent on July 1, 2012. For several years after college he played fast-pitch softball with the Tremont Merchants and now enjoys working with district students and staff, watching their activities and those involving his kids. He loves travelling and all types of outdoor activities. Mr. Hinman is actively involved in several local and professional organizations. He enjoys talking about the great things going on in District #702 classrooms. The importance of a community-based, locally-controlled, and strongly-supported educational system is something he remains passionate in promoting. The Tremont system truly provides a solid foundation and has a long history of educational excellence. With assistance from a supportive community, he believes Tremont students are well served and prepared for the many opportunities that lie ahead of them.